"A simple, light 'Chinese dumpling' classic ...whether in soup or fried, wontons will always bring you that mysteriously delicious taste of the Far East ...! Garnish with fresh scallions." In a large bowl, combine pork, shrimp, sugar, wine, soy sauce, 1 teaspoon chopped green onion and ginger. Blend well, and let stand for 25 to 30 minutes. Place about one teaspoon of the filling at the center of each wonton skin. Moisten all 4 edges of wonton wrapper with water, then pull the top corner down to the bottom, folding the wrapper over the filling to make a triangle. Press edges firmly to make a seal. Bring left and right corners together above the filling. Overlap the tips of these corners, moisten with water and press together. Continue until all wrappers are used. FOR SOUP: Bring the chicken stock to a rolling boil. Drop wontons in, and cook for 5 minutes. Garnish with chopped green onion, and serve. 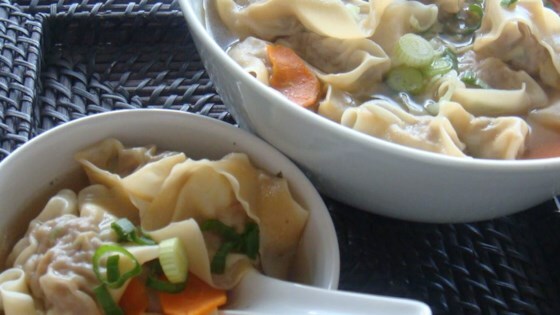 See how to make tasty stuffed wontons simmered in a light chicken broth. TO FRY: Heat 2 to 3 cups of oil in a wok until hot. Deep-fry wontons in batches until golden, 2 to 3 minutes on each side. Drain. Serve with dipping sauce or duck sauce, also called plum sauce.